Watch out for Barnet Alliance banner in the assembly point, Jubilee Gardens. PLEASE HELP IN THE FINAL WEEK! If you or your group can volunteer as stewards please let us know as soon as possible. 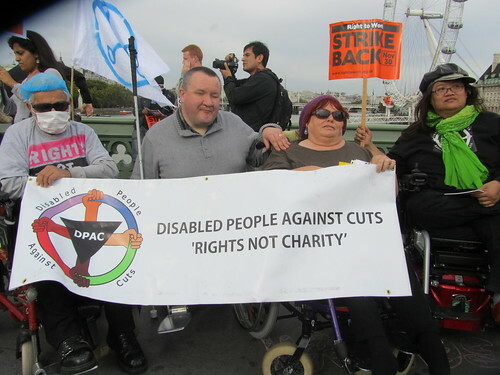 CAN YOU HELP MAKE PLACARDS? Please let us know if you could help make placards on Wednesday or Thursday 15/16 May. Can you get your local papers to cover the demonstration? Do you have any local patients or others who it would be good to include in a London press release? We have managed to pay for the postcards through donations, but would like to be able to print posters, make placards and hire a bus, so please do make a donation if you haven’t already. Public Meeting: BARNET NHS UNDER THREAT? The end of the battle for saving the NHS? Today, Labour have forced a Commons debate on whether MPs can consider planned NHS changes for a final time before an assessment of the potential risks to the health service is published. And opponents are trying to mobilise support behind a last-ditch attempt to try and delay the bill. Lord Owen lost his amendment this afternoon by 213 to 328 votes with the enemies of open government resorting to increasingly ridiculous arguments to defend the government’s refusal to release the risk register. Andy Burnham has made a last-minute request which will lead to a brief debate on the risk register, this time in the Commons, to be held tomorrow as first item of public business. It’s hard to see it having any effect. Read Tim Hardy’s analysis at Beyond Clicktivism. If you need some background, watch The Professional Case for Withdrawing The Health and Social Care Bill from Daniel Saul on Vimeo. There is much protest which is not being reported by the main stream media. Many thanks to Steven Sumpter for letting us repost some of this blog (from March 17th). 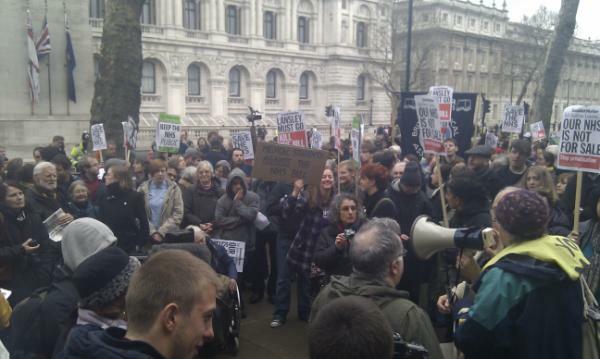 Read the rest about how Heavy handed police threaten NHS protest and follow the links at his blog. Join the mass day of action to save our NHS – Wednesday, 7 March from 1pm, Houses of Parliament, London. Find out the latest transport details and coordinators from Unite’s regions. In less than three months the government’s Health and Social Care bill will be law. This is a national emergency. Unite says that if you want a NHS that is fair, where treatment depends on need and not the ability to pay then the bill must be dropped. Our NHS is a national treasure that we should all be proud of. It has cared for generations of working people. It places fairness at the heart of our society. The bill puts profit before patient care and will destroy the NHS that we know and love. When: Wednesday 7 March from 1pm to 5pm. Later that day… Join the TUC SAVE OUR NHS mass rally – from 6pm to 7.30pm, in the Great Hall, Central Methodist Hall, Westminster, London. Make sure you register online for the TUC NHS mass rally. If you can’t attend the rally you can send a message of opposition to the bill by texting the word NHS and your message to 86888. Download a leaflet and tell us why you support the NHS. 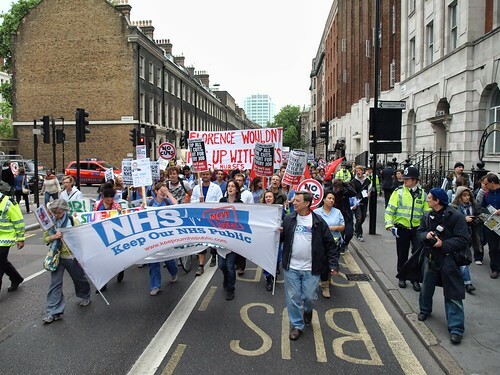 This march was initiated by health workers in Unite the Union, who felt that the savage attacks on the NHS needed a stronger response than the media event planned for the NHS 63rd birthday. The ‘listening exercise’ on the Health and Social Care Bill was a PR job, and has resulted only in minor cosmetic changes. The clear intention is a corporate takeover of our NHS, and the end of a comprehensive and universal healthcare system. The combination of this legislation and £20 billion ‘efficiency savings’ is an utter disaster. The legislation is now being rushed through, with little time remaining to organise in defence of the NHS. This demonstration is an incredibly important one for health workers, to build our confidence and help us organise and fight against the coming onslaught. It’s an important demonstration, too, for all of us – to build practical unity between NHS workers and the wider community, and to send a clear message to Cameron and his chums that we will fight them every inch of the way. Our health workers in Unite would welcome anything you can do to publicise this march, and to encourage your supporters to attend. The demonstration assembles at 5.30 pm on 5th July at Savoy Street, Strand, London, and marches to Old Palace Yard (opposite Parliament).